Hunza Valley is a mountainous valley located in Gilgit, which is an area under the government of Pakistan. The main town of Hunza, Karimabad (formerly known as Baltit) is the capital as well as most popular tourist destination of Hunza. As famous as the valley is for its beauty, the people of Hunza are also well-known for their friendliness and hospitality. 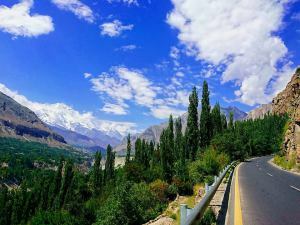 Hunza’s tourist season is generally from May to October, because in winter the Karakoram Highway is often blocked by the snow. Unlike most places in Pakistan, Hunza valley has a very high literacy rate of more than 90%!